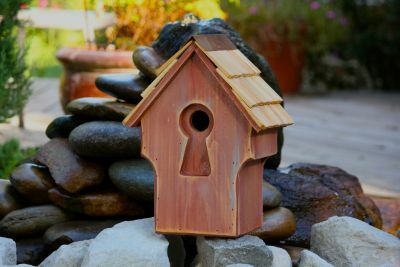 Peep through this keyhole and you ll undoubtedly see some happy campers, in a stylish home sure to open a whole new world of birding enjoyment for you and your family. Peeper Keeper s winning vintage design features rugged copper-ridged roof, cypress shingles and wonderfully long-lasting quality. No doubt about it: this hand-made, one-of-a-kind creation is definitely a keeper. Available in Rustic Red, Rustic White, Rustic Blue. This handcrafted USA made birdhouse has a winning design with a rugged copper ridged roof, cypress shingles and long lasting quality. Made from rot and insect resistant Cypress wood. 1 1/2" hole along with ventilation, drainage and clean out all built in.